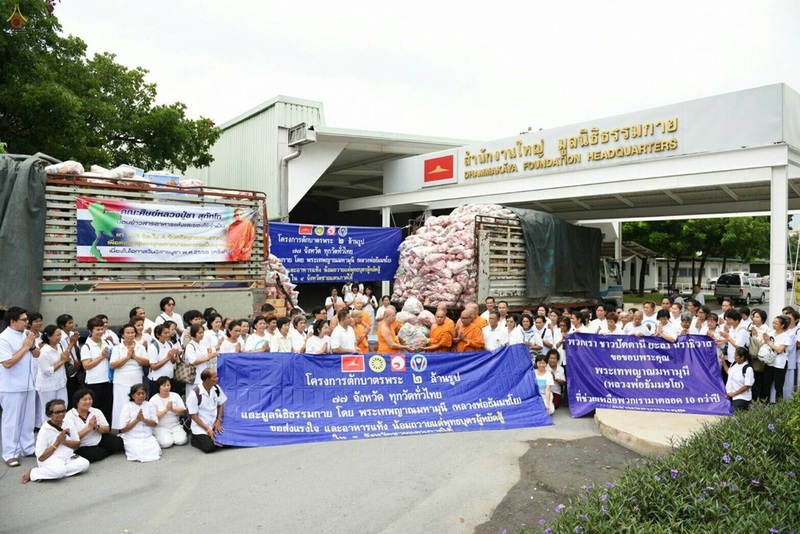 The 2-Million Monks Nationwide Alms-offering 77 Provinces Throughout Thailand And the Dhammakaya Foundation, initiated by Phrathepyanmahamuni (Luang Por Dhammajayo) sends their moral support and dried food to offer to the courageous monks in the 4 southern most provinces of Thailand. Devotees from Pattani and Narathiwat would like to offer our sincere gratitude to Phrathepyanmahamuni (Luang Por Dhammajayo) for providing aid to us for over 10 years. Additional photos verifying the alleged rice and other foods being sent to “the temple in Pathum Thani province in order ‘to encourage the clergy’” were actually sent to their intended destination: Narathiwat. Accused truck arrives at intended location: Narathiwat Province. Not Wat Phra Dhammakaya, Pathum Thani, as accused. As you can see, the truck with the license plate of ‘70-2389’ was filled with dry foods was parked in front of the Dhammakaya Foundation Headquarters. The adjacent photo shows the same truck en route to its destination as it approaches the 'Welcome to Narathiwat' sign. Military personnel unloading dry foods at Narathiwat Youth Training Center. Soldiers provide safety to those delivering and receiving the food that has been sent as aid for the Southern Thailand Region. Armed military personnel, standing inside the tents filled with mounds of rice sacks and dry foods, are not there to guard the food but to ensure the safety of the people making the delivery from any dangers that may arise. The unrest in the southernmost provinces of Thailand has made it too dangerous for monks to perform the daily monastic duty of going out for their morning alms-round, or even to receive the delivery of these dry foods. To subsist, the monastic community in these regions are dependent on these dry foods. To ease their plight, the Most Venerable Dhammajayo has been sending food and requisites to this area continuously for over the past ten years. If the article opens with a misleading photo caption, what can we say about the content in rest of the article? Should Bangkok Post post a warning in its articles to all its readers: “Please read with caution, information provided here may or may not be completely accurate”?